I’ve lived in plenty of houses with porches–they’re sort of de rigeur down here, after all–but very few have been “functional” porches. What do I mean by functional? 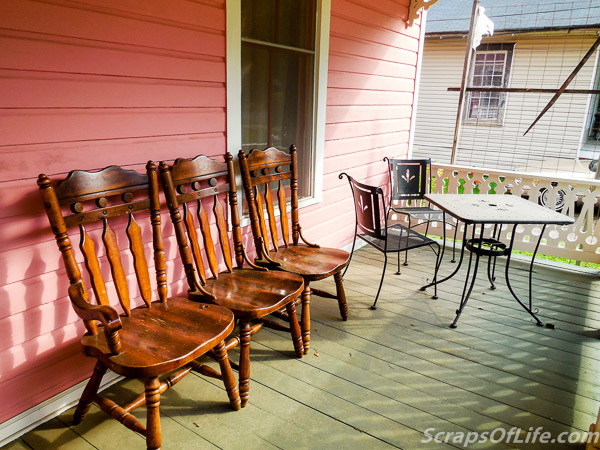 A porch that could barely hold a single chair, much less two. A glorified concrete slab under an extended roofline without even a railing to speak of. Uninviting. Austere. No fun. 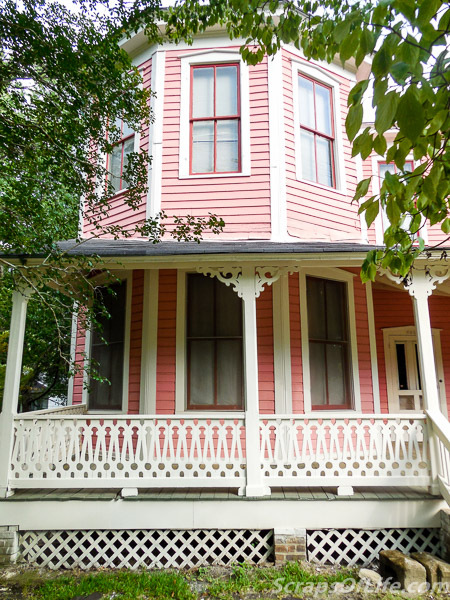 A porch can serve asÂ either a deck with a roof over it or an awning with a floor under it. The former is a place to hang out and have fun with the aid of some shade, the latter being only concerned with sheltering windows from the full-on sun. The best porches, though, are easily both and so much more. I love coming home to this every day. Driving up to the Dollhouse each day makes me smile. 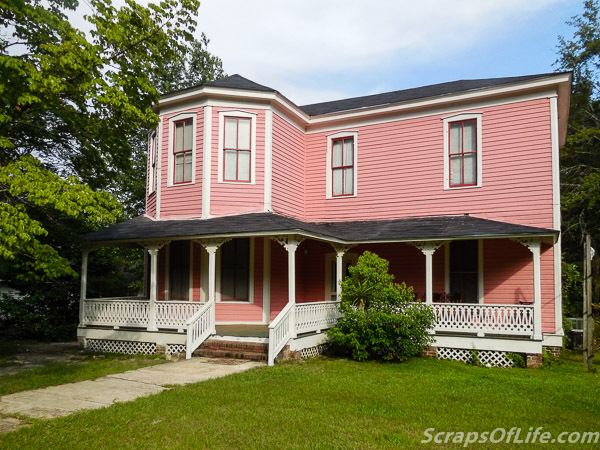 Part of it is just knowing that it’s ours, all ours, and part of it is the pretty pink exterior set off by the white porch. Our porch is made for sitting and watching the world go by. But it needs a little work. It might sound strange, wanting privacy on a porch that faces the street and all, but it’s not like I want to enclose the entire thing. It’s more than I want a little more definition on the sides of the porch. Our lot is ~70×209, so the neighboring lots are fairly close. Not so close you could reach out and borrow a cup of sugar through facing windows, but a driveway apart. The east side of the house (that would be the left when facing the house) has a line of trees that creates some natural fencing, but the west is not so lucky. And while I like our neighbors well enough, I don’t want to feel self-conscious about not talking to the residents that routinely take the afternoon sun next door every time I venture out. So, instead, adding some lattice panels, painted white, to each end of the porch will provide a tiny bit of privacy, some additional shade if we’re out there in the late afternoon, and still look pretty. I was inspired by the spandrelsÂ on some very fancy Victorian homes like this one. And while I’m on the subject of “walls,” another update I’d like to make is to the railing and corner pieces. Not change them for something else (are you kidding, that’s what gives the Dollhouse its Gingerbread designation! ), but add a little more color. The Victorians didn’t shy away from bright and bold, so I thought it would be nice to paint the cut sides of the white balusters andÂ brackets with our accent colors (the dark green and red) and maybe some additional decorative painting on the faces of the brackets. I’m also wafflingÂ between adding some additional molding along the top of the porch, but that might be a later update. 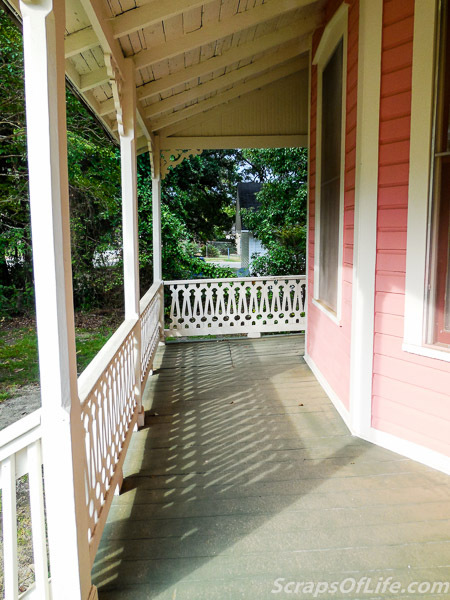 Finally, on the color front, our porch ceiling needs repainting already. (grumble grumble shoddy prep by “professionals” grumble grumble) It’s been peeling and chippy for months, so we knew we’d be tackling it eventually. 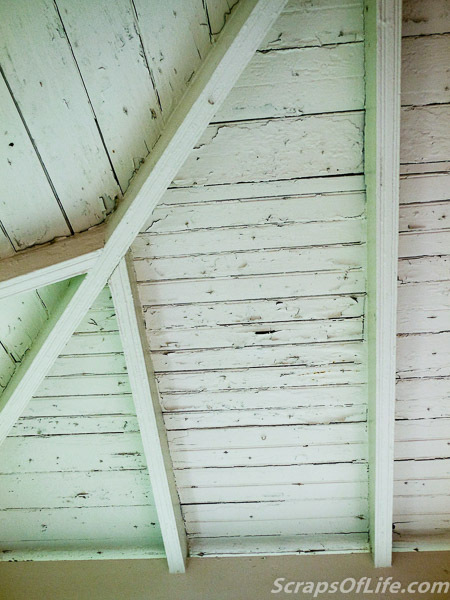 Now, apparently it’s a very Deep South thing to paint porch ceilings blue. Funny, I’ve never actually seen one or heard of this until very recently. I asked Mom and she confirms that this is not a thing in Louisiana, at least not that she observed in all her years there, only reading about it in magazines over the last little bit. I know geography isn’t my strong suit, but it still amuses me that you can call something a “Deep South” thing when you’re talking about eastern seaboard states that are a lot closer to the Mason-Dixon line than my home state or even my current one. 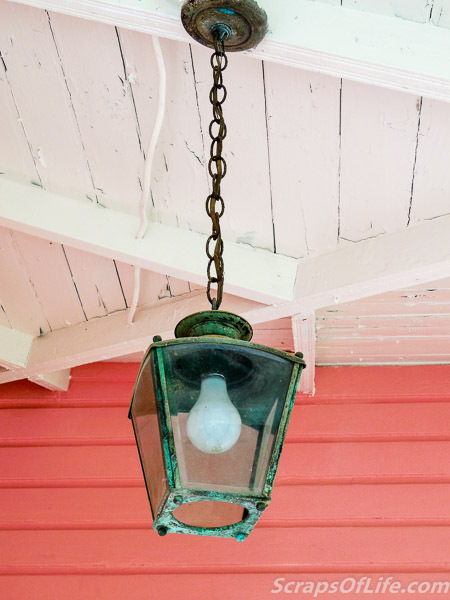 Will we paint our porch ceiling blue? Not sure. I don’t mind the idea, especially if there’s a chance it could discourage the wasps from building their nests in the eaves–we have gone through so many cans of wasp spray this first year it’s not even funny. Currently our porch sports a wire patio table and 2 chairs. They’re nice enough, though the chairs could use cushions, but they need a refresher. We also ended up with some spare dining chairs (I laugh at our surplus of seating these days, after so many holidays of dragging in said patio chairs and office chairs to the table) that I’ve set out on the porch for now. Things are looking a little rag-tag at the moment. This would be the main sitting side of the porch. First I think I’ll give the patio set a good wire brushing and then a couple coats of outdoor spray paint in bright white. I don’t usually go for the when in doubt, paint it white school of decor, but the railing has such great contrast with the pink house paint and green floor that I think it’s the way to go in this case. Okay, while that possibility spins in the back of my mind, the three refugee chairs also could benefit from a coat of paint along with other repairs. And after seeing them sitting so close together like this, I began wondering if I could (and by that you know I mean Todd) join them together and make a chaise lounge out of them, capitalizing on the single armed-ness of the one chair. I’ve wanted a chaise lounge for so long–probably the one piece of furniture I’ve wanted, unabated, since childhood–and this looks like a good way to DIY it. I can pad the single arm and made cushions out of outdoor-friendly fabric and foam (and make matching ones for the patio chairs) and it’ll be the prefect place to lounge on the few days of the year it’s bearable to be outside. There’s a difference between antique and decaying! Fan or no, we definitely need a new porch light. 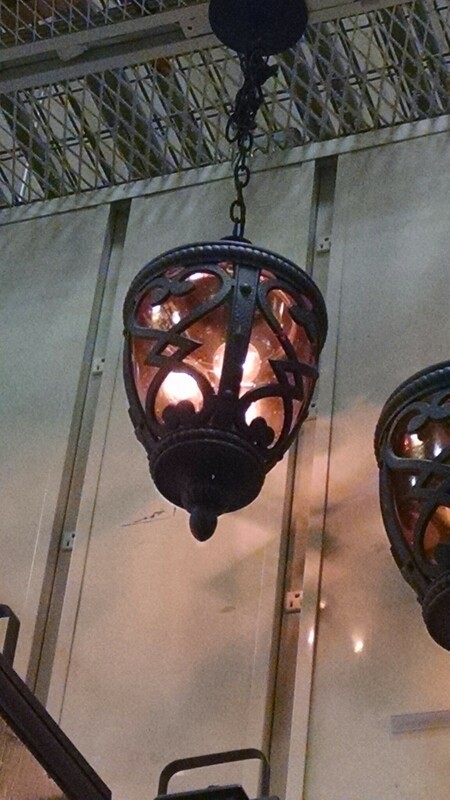 We’ve spotted some contenders during our many trips to Lowe’s for one thing or another. Also in the plans are some shutters for the windows in the same green as the porch floor and, finally, a new front door. Screen optional. 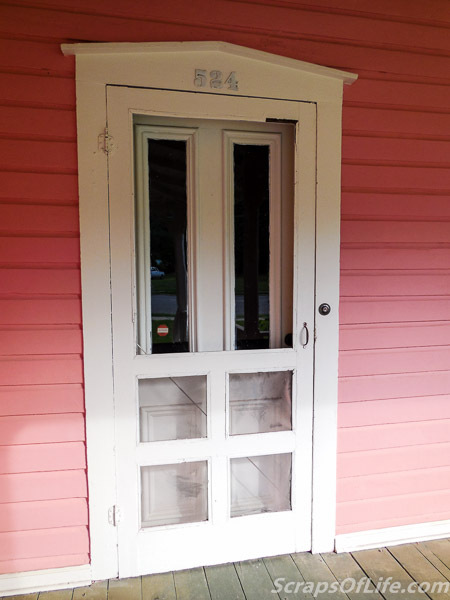 Our front door is in really sad shape: there’s a pronounced gap at the top, it only stays closed when the deadbolt is flipped, and (as I believe I’ve mentioned before) it swings the wrong way. Todd brought home door brochures from Lowe’s and absolutely nothing looked right to me. I want glass, but not frosted or textured. The ones with leading are nice, but too modern. Â Basically, I want something that looks a lot like our back door, but with a single pane of glass, either 1/3 or 2/3 the height, not half or full glass. Okay, what I really want are a pair of narrowÂ double doors with side lights, but that would require changing the entire front of the entryway and, well, I don’t want it that badly. And there’s a better chance of us finding a salvaged door that Todd would have to man-handle into what I want than finding it in the store, but we’ll cross that bridge when we come to it. We’ve also talked about maybe having a porch swing installed (but I’m not sure the porch roof would hold it), and a second seating area over on the opposite side of the porch by the living room bay. It’s not quite as spacious over there, but there’s room for a small chair and table, I think. Our porch is pretty spiffy as is, but I look forward to spending more time out here once we’ve squared away a few details. Thanks! We’ll definitely be posting pictures as we tackle each section of the house!